Setting a unique precedent in the history of Lowell High School Athletics, Caitlin Barry won honors not only in several girls sports but also an important member of an otherwise male Lowell High team. As a member of Coach Mike Crowley’s LHS Basketball team during perhaps its most successful era, Caitlin played a key role in the Raiders’ fortunes. A deadly outside shooter, Caitlin set school records in 3-point field goals for a single season (43) in 2003-2004 and a career (75) 2001-2004. Caitlin’s often torrid shooting helped break open numerous contests throughout her career. Caitlin was team Captain for her senior season (2003-2004) and earned Merrimack Valley All-Star honors as well. A three-year varsity performer for Coach Rick O’Brien’s softball team, Caitlin played on three consecutive Massachusetts State Tournament qualifying Raider squads. 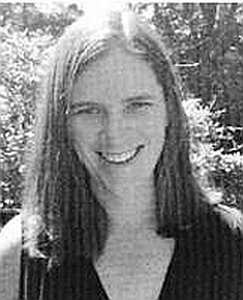 She was Co-Captain of the Red and Gray team in 2004. Caitlin never had the opportunity to complete her career as a field hockey player, as she made the decision to join the LHS Golf team for the 2003 season. Previously a bastion of male participation, the LHS Golf team and Coach Richard O’Loughlin welcomed Caitlin into its ranks. The next two season (2003 and 2004) witness the dawn of a new era in Lowell High School Athletics as Caitlin played on an otherwise all boys team against all boys teams in the highly competitive Merrimack Valley Conference. As a senior (2003) she played the number one position and was elected team Captain of a State Qualifying Team. Lowell’s MVP Caitlin won Boston Globe and Boston Herald All-Scholastic honors and also was named to the Lowell Sun All-Star Team. At the conclusion of her ground-breaking career, Caitlin received the prestigious John J. Beaulieu Award as the Outstanding Female Athlete during her tenure at LHS. After graduation Caitlin attended Rollins College in Florida where she was a key member of the Women’s Golf Team that won three National Collegiate Championships and numerous other tournaments during her four years at the school. During her time at Rollins Caitlin played with and against golfers from around the country and the world. She served as an Assistant Golf Coach at Rollins at 2008-2010. Since graduation from Rollins, Caitlin has continued her golfing exploits as an amateur, winning the Lowell Women’s City Tournament three times. She has also pursued a coaching career in the Billerica High School Girls Basketball and Softball programs and as Billerica’s Boys Golf Coach (2011-2014).